Walking to Japan IS IN PRINT! I continue to spend Derek's birthday and other special anniversaries in places that were special to him. The days always involve walking, meditating and often eating fish and chips! In the summer of 2012, during my pilgrimage to England, I felt encouraged by Spirit to return for a longer stay. This became a dream, and after much hard work and planning and help I was able to make it come true. From July of 2013 to New Year's Eve, I spent six months in London, living simply, exploring the city on foot. 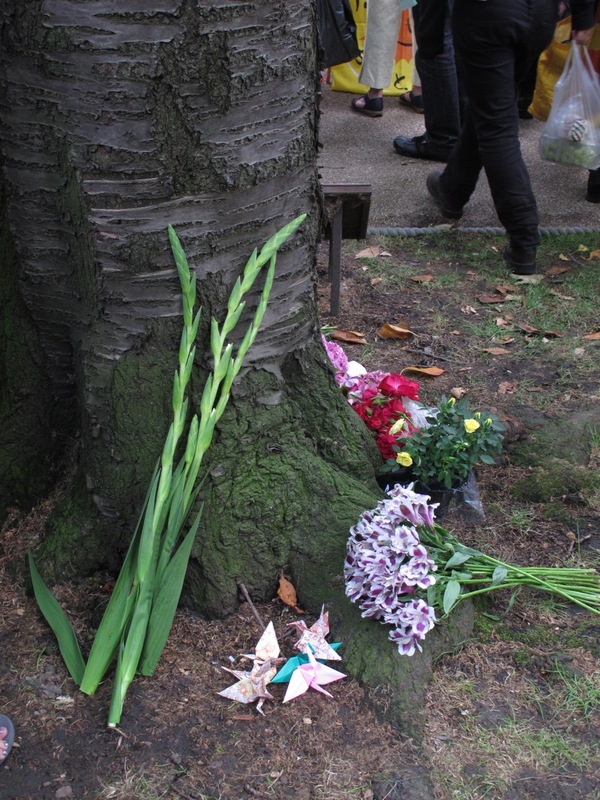 On August 6th of that year, Hiroshima Day, I walked to the Battersea Park Peace Pagoda in South London. 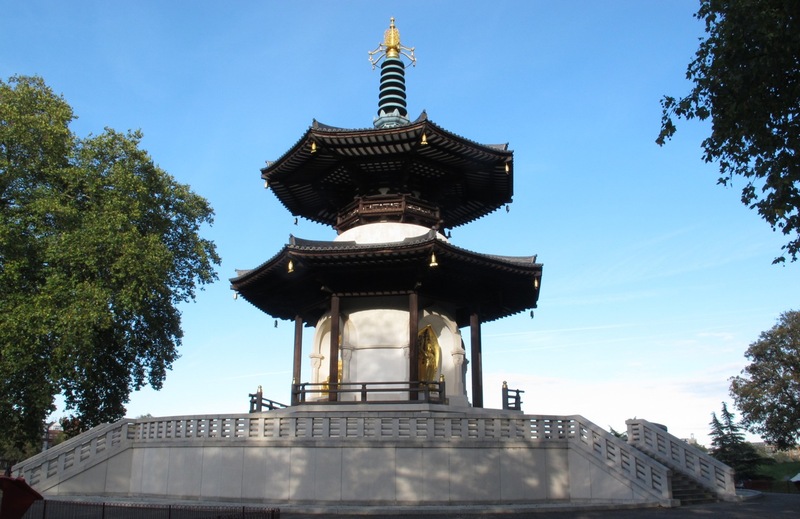 This pagoda was of great importance to Derek, as it was where he began his major European pilgrimage in 1990. 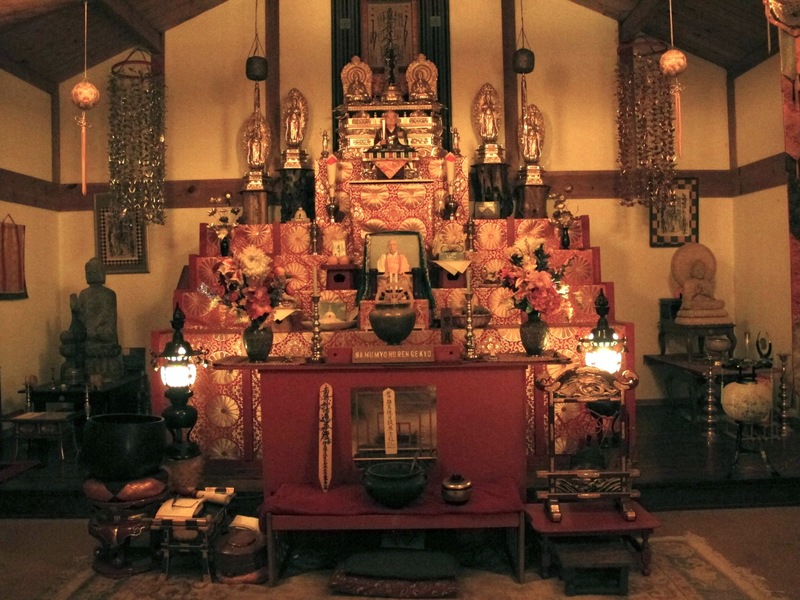 He was sent off by Reverend Nagase, a Japanese Buddhist monk of the Nipponzan Myohoji sect, whom he'd met on one of his first peace walks in the 1980s. These monks had a tremendous influence on Derek and he walked with them several times. 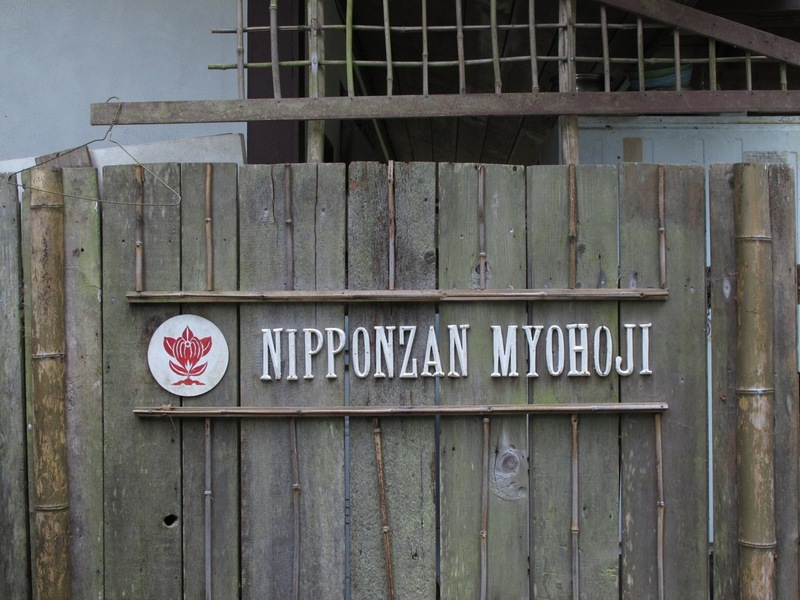 After the tragedies of WWII in Japan, Nichidatsu Fujii, the Nipponzan Myohoji founder, gave up meditating and began walking for peace. Never again did he want the world to experience nuclear war. Since then, monks in this order have walked worldwide and built over eighty peace pagodas in Asia, Europe, and the US. Derek and I came to the Peace Pagoda in 2007 to see if Reverend Nagase or another monk might be there, but nobody was home. I returned in 2012, but my knocks went unanswered again. This time, though, the door opened! In front of me stood a slight, bald, Asian man. I knew right away he was Reverend Nagase! He smiled, bowed, and welcomed me in. I quietly and briefly told my story—who I was, and why I was there—and I saw a quick little look of sadness pass over the monk’s face when I mentioned Derek’s death. 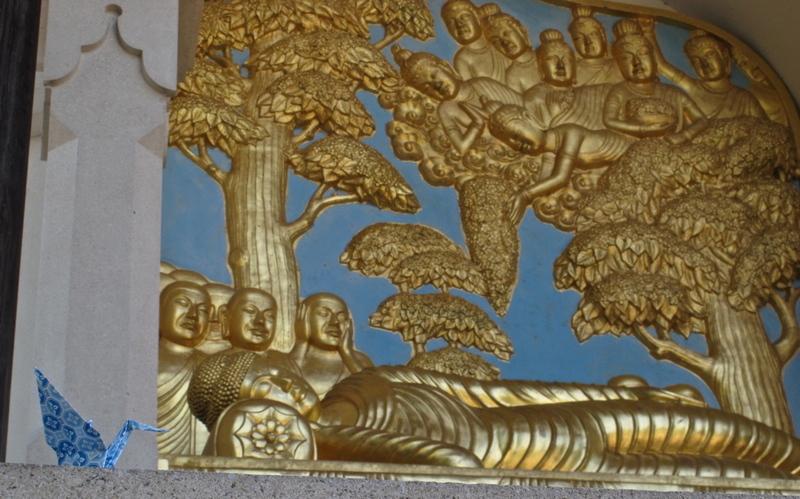 Then, he bowed three times to me, and kneeled down facing Buddha's shrine on the back wall. I did the same, and then he began chanting. 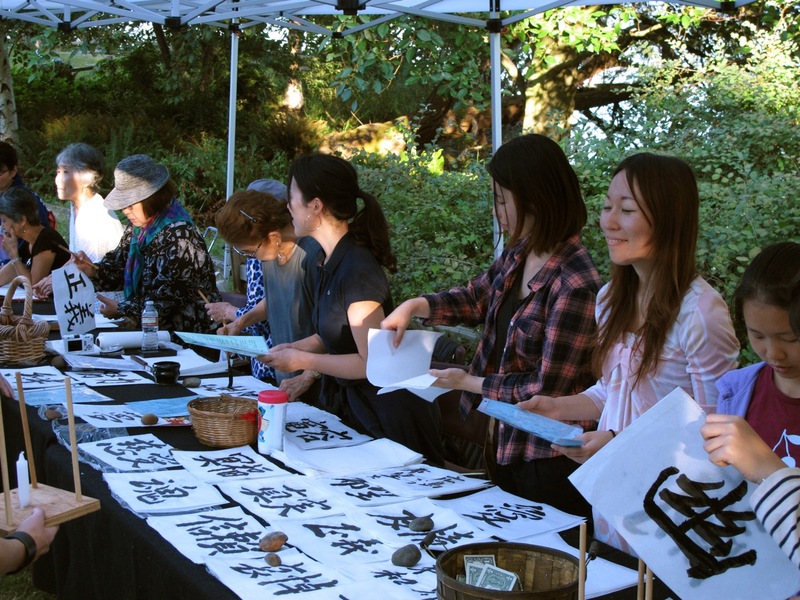 I joined in with the words Derek had taught me: "Namu Myōhō Renge Kyō." After we finished chanting, he then retrieved a little bowl from the shrine. He smiled, and offered me a caramel from the dish. I traded it for a peace crane. Again we bowed to each other. I sensed now that he was now eager to chat. 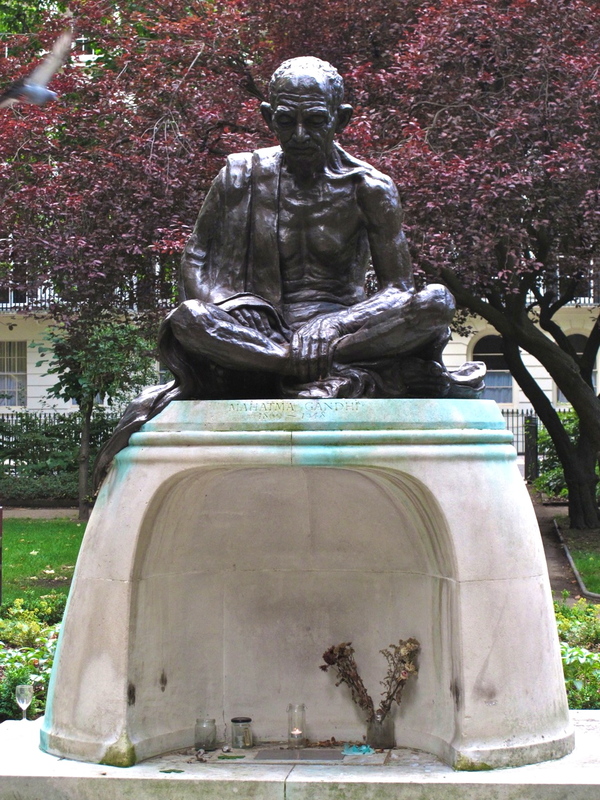 Despite living in London for over twenty-five years, he is relatively isolated, and his accent is still thick. My Japanese is minimal, but we managed to exchange stories and thoughts. I spent the rest of my visit in awe, feeling incredibly lucky to be spending time in such a beautiful place, with this very special person. 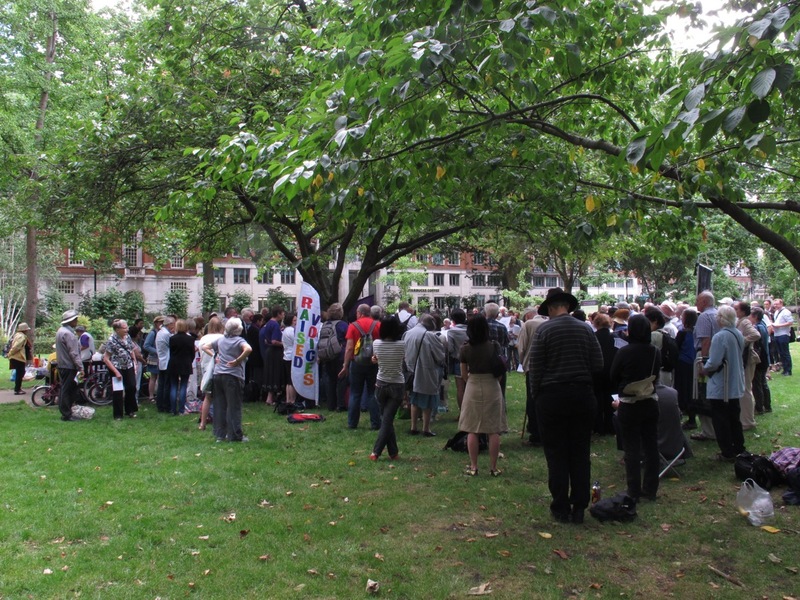 That afternoon, we attended a Hiroshima event together at Tavistock Square. Rev. Nagase invited me back the following day to make paper lanterns for the event that was to take place in Battersea Park on Aug 9th, the 68th anniversary of the Nagasaki bombing. 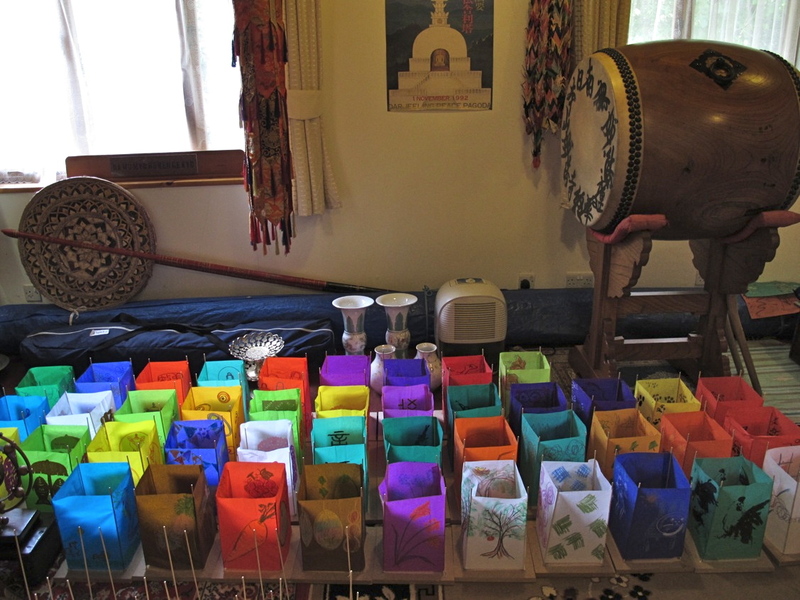 I indeed returned, and spent four hours working on lanterns with a couple of other volunteers. In no time, my sense of awe transformed into complete comfort. We talked about favourite authors, a couple of his being Ruskin and Thoreau. He asked if Canada's landscape was really was as vast and wild as he'd heard, and if there were bears everywhere. I confirmed that it is truly a big country, and although bears are not as ubiquitous as he'd imagined, I had seen a resident bear traipse through my back yard some mornings on the Sunshine Coast. 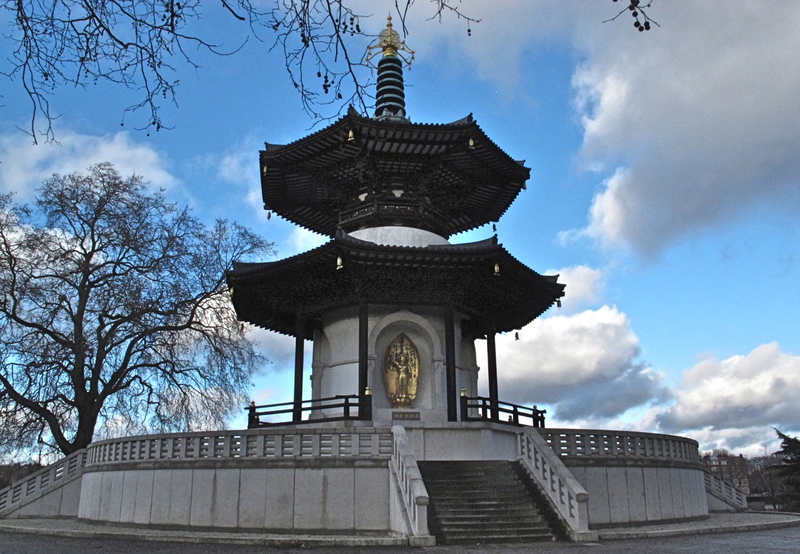 I learned that Reverend Nagase was the only one who tends both the Battersea Peace Pagoda regularly, so I offered to come back and help in any way he needed. For the rest of my stay in London, most Wednesday afternoons were spent cleaning the temple or raking leaves, or folding pamphlets. I'd bring salad and sushi for lunch, and Rev. Nagase would provide soup and tea, and sometimes a delicious Japanese curry if I was lucky. Our meals were always quite formal, first blessed on the shrine before eaten from a low table set on the floor, where we sat on flat cushions. I missed Reverend Nagase when I returned home to Canada. He had become a good friend. This summer, I began to think of London and Reverend Nagase as August 6th approached. I knew I had to do something special to commemorate Hiroshima this year. 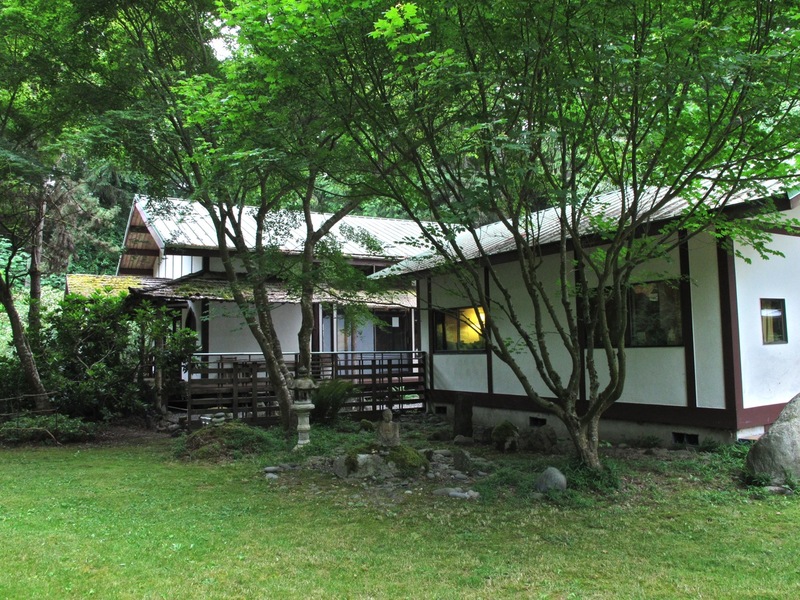 Then I remembered that the Nipponzan Myohoji monks had a temple in Washington State, a ferry's ride away. 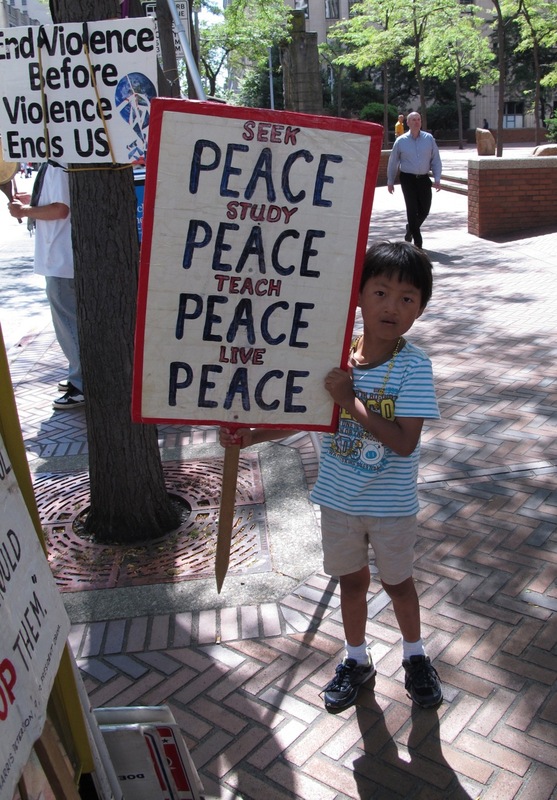 In fact, I had met two of these monks in Vancouver at the World Peace Forum in 2006. 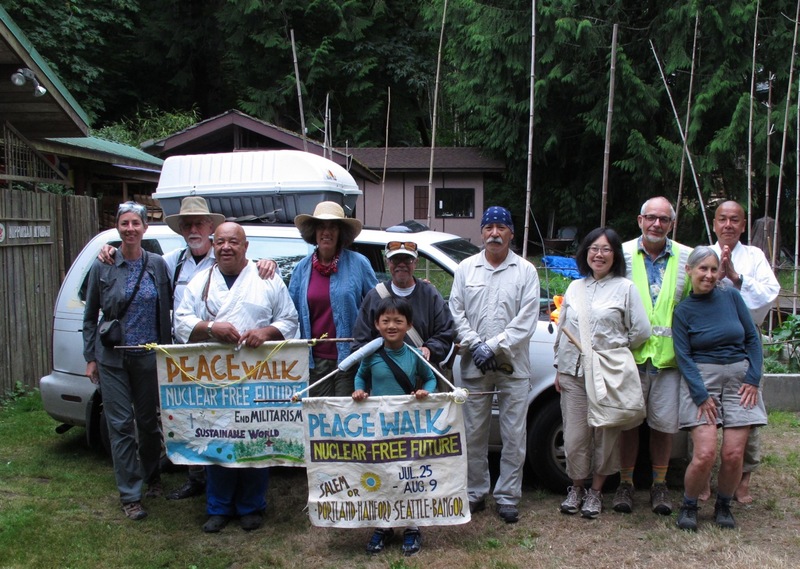 A quick internet search informed me of the two-week Interfaith Peace Walk that the monks were undertaking from Portland to a nuclear submarine base near Seattle. They would conclude the walk with a peaceful roadblock of the base. I sent an email, and heard back promptly from Brothers Senji and Gilberto, who welcomed me for as long as I could join them. I met the monks and other walkers in Tacoma. We spent five to six hours on the road each day, walking alongside the highway. At least half the walkers had drums which they beat in time with their chanting, and this rhythm was ceaseless, except when stopping for water and lunch breaks. I didn't try drumming until the last day when I heard Derek whisper in my ear, "Try it, you'll like it." It was true. 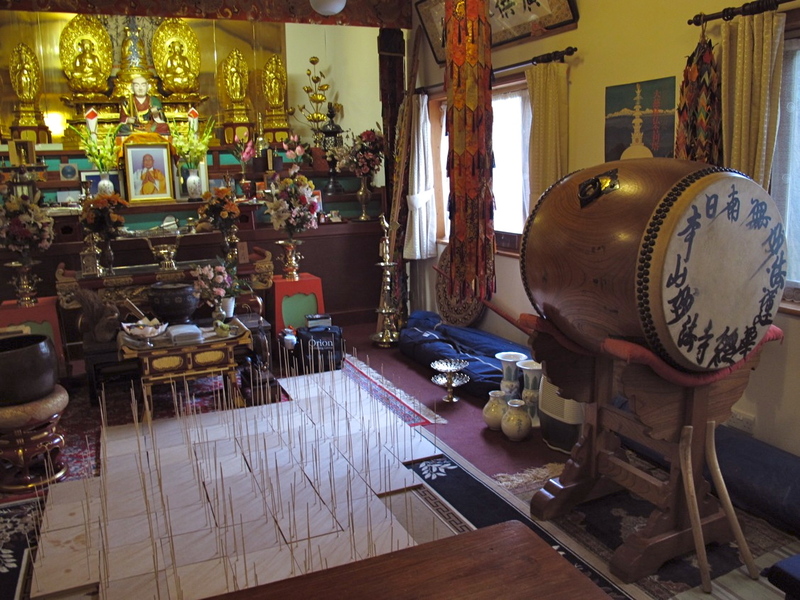 Somehow the chanting combined with the drumming and walking created a peaceful state for me which was much stronger than anything I've ever experienced while simply sitting in meditation. The sun beat down on us, and temperatures exceeded thirty-three degrees Celsius. Normally this would have sent me in search of cool shade, but in this company, somehow the stresses of the heat and footfalls on hard pavement melted away. 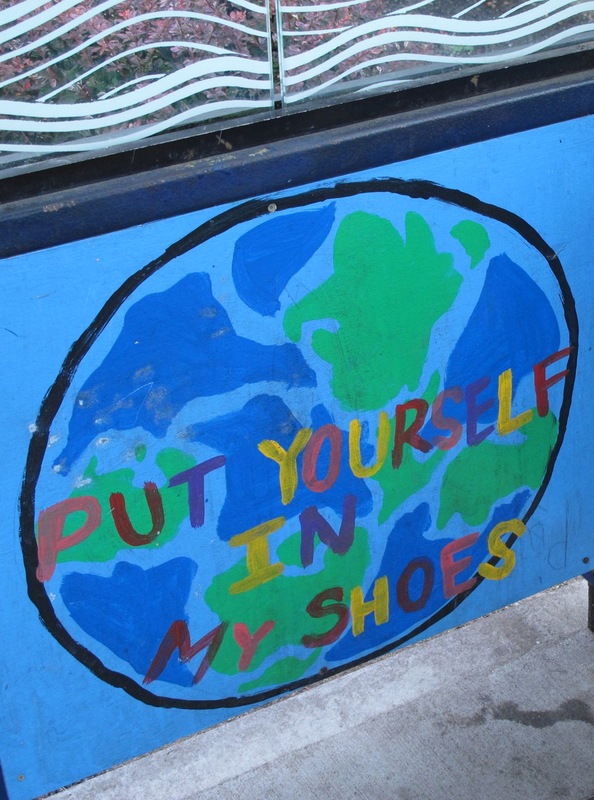 With each other's support, we could all walk our walk. 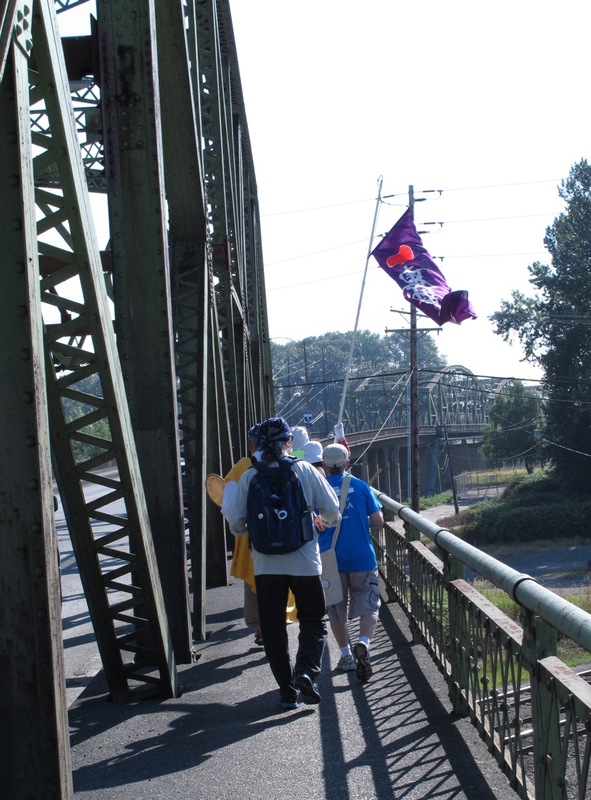 Some walkers began in Portland and walked all the way. Other folks came for a few days, from as far away as Chicago, San Francisco and New Jersey, and at any given time there were at least half a dozen, walking single file along the road, chanting, drumming and carrying banners and a large purple flag. Our youngest was an eight-year-old whose energy was boundless. One afternoon, we joined a peaceful protest in front of the Federal Building in Seattle. This has been a regular event for over a decade, and every week, the names of Washiington State military officers killed in action are read out, one by one. Many people walk by, not noticing or listening, but for me it was incredibly moving to stand there and take in every name. It brings the tragedy right into your heart. 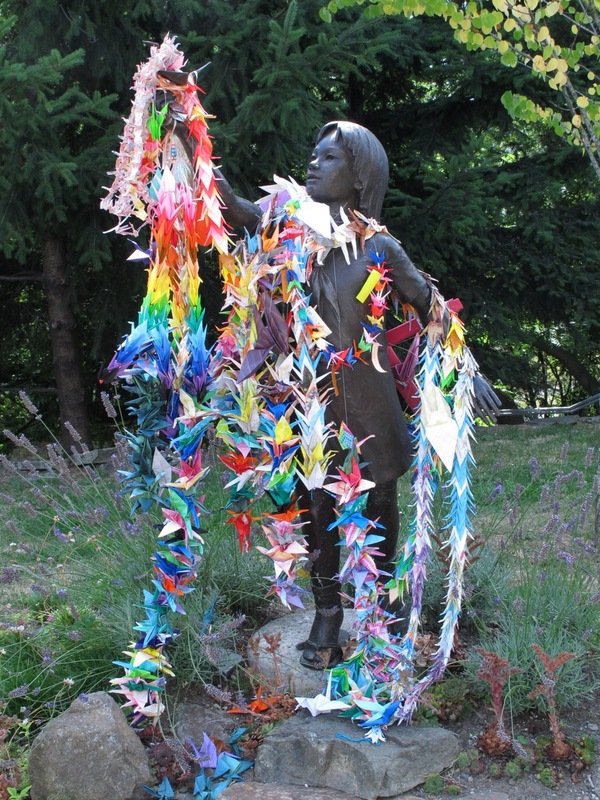 Later, I calculated that to read all the names of the victims of Hiroshima and Nagasaki one by one would take TWO WEEKS. After a potluck dinner one evening beside the campfire, Brother Senji (from Japan) sang Paul Robeson spirituals in a clear baritone voice. Later Brother Gilberto (an Afro-Cuban who grew up in Spanish Harlem) shared a joke. "So three monks take a vow of silence and go into the wilderness. 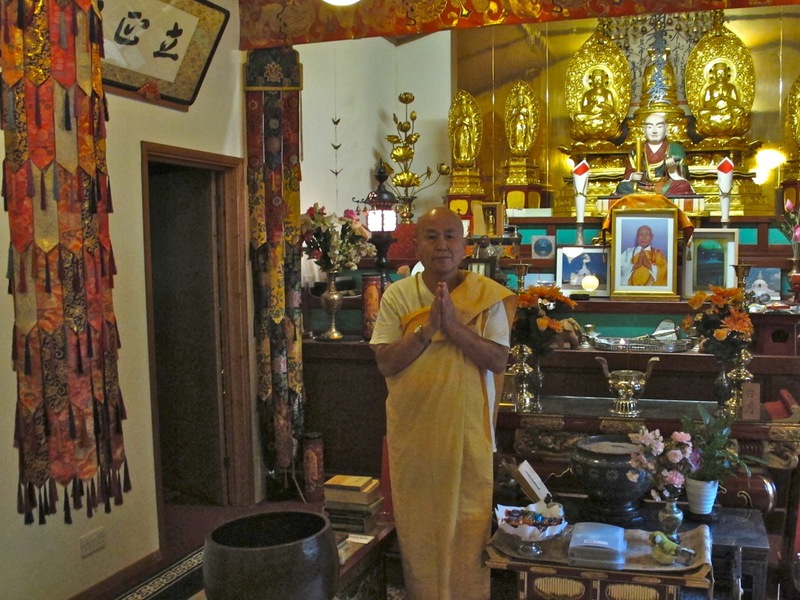 After a year, the first monk breaks silence and says, 'It's raining awfully hard.' After another year, the 2nd monk pipes up, 'Now it's snowing.' 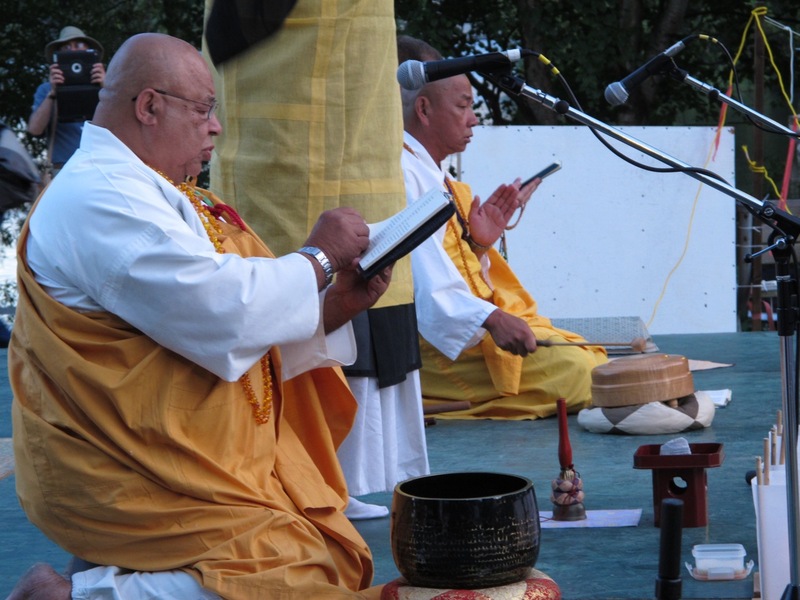 Another year goes by and the 3rd monk says, 'Will you guys shut up- you're talking too much!'" 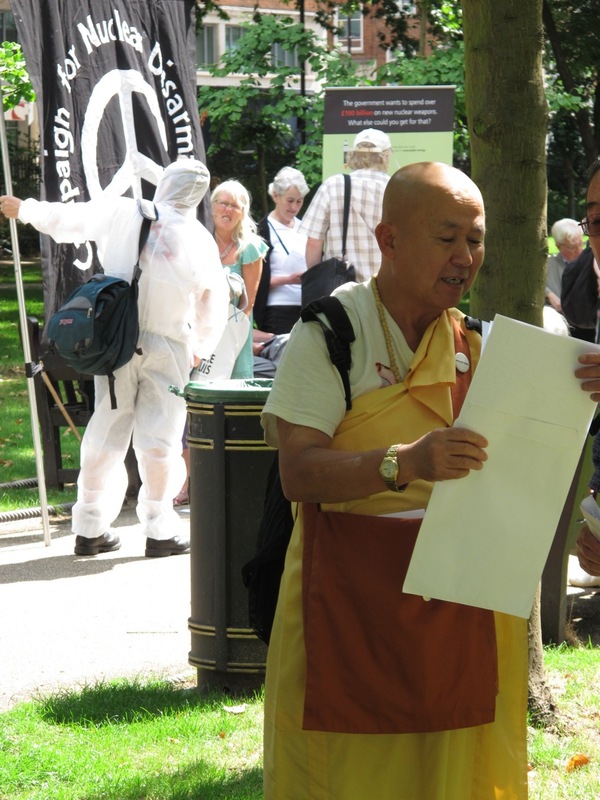 Both monks recognize the importance of laughter in a life dedicated to peace and justice. It's as Derek said often—you must find balance. I'll never forget the dedication, tenacity, and camaraderie of all the walkers. Neither will I forget the generosity and support we encountered along the way, from those who housed and fed us, to those who honked and waved from the highway, even a police officer. The only negative comment I heard was from a pedestrian who smirked, "Bad idea!" I tried not to let this bother me. But what, I thought to myself, is a bad idea in all this? Interfaith? Walking? A nuclear-free world? I didn't understand, but I sent the woman loving thoughts as she disappeared on the road behind us. 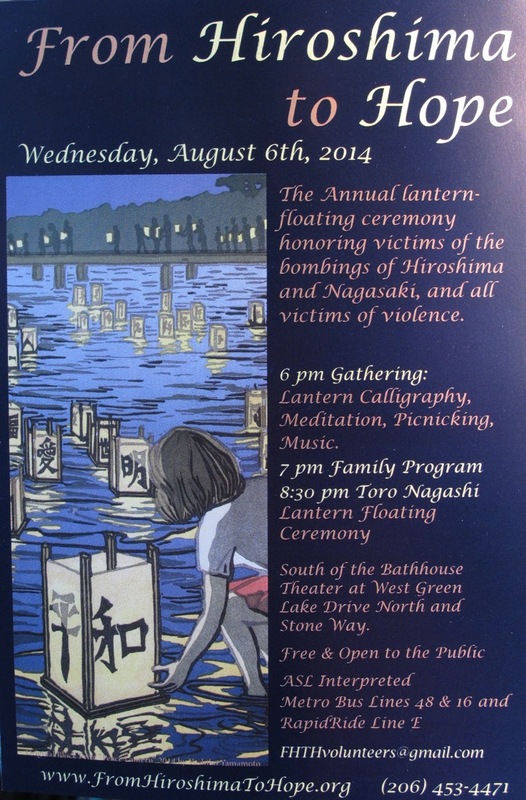 On the evening of August 6th, we took part in a lantern ceremony at Green Lake in Seattle. We enjoyed a concert of beautiful Japanese music, and then, after Brothers Senji and Gilberto mounted the stage to add their prayers and chanting, the crowd, led by the peace walkers, processed towards the lake to release their lit lanterns, which floated away gently on the waves. I enjoyed my stay that night at the Bainbridge Island temple in the woods. The place is a simple, but beautiful place to live and work. I am so inspired by these selfless monks, who, in these crazy times so full of strife and despair, are working every day for a better world. We all may not choose a life of chastity and poverty, but we can indeed all do our part, however we are moved to. But it takes courage, and focus, and effort. The next morning I had to depart, as I had a wedding to attend at home. After hugs and farewells the next morning, I caught the ferry back to Canada, the sound of drums and chanting ringing in my ears. Each morning now when I set out for my hike up Mount Douglas, I can still hear the drumming.